Muscicapidae is the family of Old World flycatchers comprising a dozen or so genera, one of which is Niltava. Exactly how many Niltavas make up the genus depends on which literature is consulted, although the long-established and traditional view is that it contains six members: BreedingGreater NiltavaGreater Niltava grandis, Lesser NiltavaNiltava macgregoriaeLesser N. macgregoriae, Fukien NiltavaNiltava davidiFukien N. davidi, Rufous-bellied NiltavaNiltava sundaraRufous-bellied N. sundara, Sumatran NiltavaNiltava sumatranaSumatran N. sumatrana and Vivid NiltavaNiltava vividaVivid N. vivida. Some authorities, however, have greatly enlarged the Niltava genus: one of the genera that makes up Muscicapidae is Cyornis, but in the checklist given by Howard and Moore this genus is eliminated and all of its members converted to Niltavas. Similar treatment is also given to several Ficedula and Muscicapa species, swelling the Niltava genus to a grand total of 24 and transforming such familiar names as the Tickell's Flycatcher into Tickell's Niltava. Flycatcher taxonomy has always been in a state of flux. Presently I can find 4 different scientific names for the Indian Verditer Flycatcher but generally such work is academic since for the aviculturist the members of this wonderful family share broadly the same requirements. In appearance the Greater Niltava is more like a thrush than a flycatcher being a fairly large, roundish bird measuring about 21cm. There is no mistaking the sexes. Although in poor light the male appears as almost black; when properly illuminated he is dazzling. Only his face, throat and breast are actually black with a sparkling cobalt blue covering the crown, nape, lesser wing coverts, upper tail coverts and forming a bar on either side of the neck which, in a paler blue, is shared by the female. His wings and tail are a dirty purplish-blue, the back a slightly cleaner shade and the underparts greyish blue. The female is an all-over pleasant brown highlighted by the shiny, light blue bar on either side of her neck. Her wings and tail are reddish brown, the vent area grey and throat very pale brown. Niltava grandis is certainly rare in aviculture although in the wild all four recognised sub-species are said to be at least common in their respective ranges: Niltava grandis grandisN. g. grandis (E. Himalayas to N. Vietnam), Niltava grandis decipiens N. g. decipiens (Sumatra, S. Thailand, Malaysia), Niltava grandis griseiventris N. g. griseiventris (S. E. Yunnan) and Niltava grandis decorata N. g. decorata (S. E. Vietnam). It is a fairly robust bird and a resident of the humid evergreen forests at elevations between l,000m and 2,500m, descending to the warmer foothills in regions where winter forces it. Various habitats are occupied from the deepest parts of the forest to clearings and along trails. It will swoop to the floor for an insect or catch slow flying insects on the wing. Even in the aviary its manoeuvreability is such that a moth can be caught after only a short aerial chase. 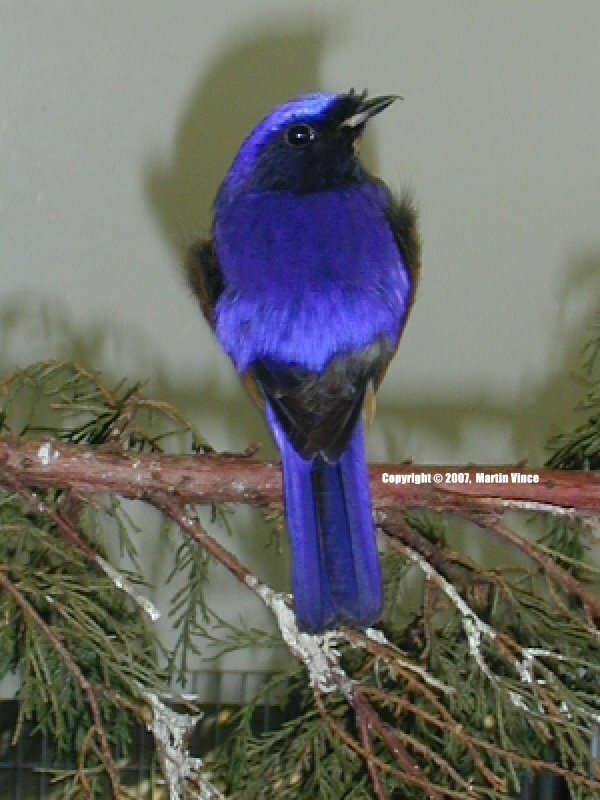 Towards the end of 1992 the zoo purchased a pair of Greater Niltavas, housing them off-exhibit in an aviary measuring 3m x 1m x 2m high. Of the 10 or so Niltava pairs I have kept (Lesser, Rufous-bellied and Greater) none of them have needed to be parted due to fighting, although certainly many insectivores are prone to such aggression, and to house the male and female alongside each other for an introductory period is prudent. Having completed the zoo's standard 30 day quarantine, the Niltavas had, in fact, been so housed and were used to the sight of each other. Without apprehension they were therefore released into their aviary, of which they were the sole occupants. The aviary is furnished with perches of varying diameters, a 1m high Rubber Plant and five hanging baskets of bushy, fast growing species; the baskets hang from the aviary's roof while the plant is on the floor, towards the front of the aviary. The birds are not especially nervous, but such foliage can only encourage breeding and generally speaking the more the better. And to increase the feeling of seclusion, coconut matting lines the aviary's walls, which also visually separate the Niltavas from their neighbours. The aviary floor is covered with coarse sand, a few log pieces and some small potted plants. It is one of a number that are collectively maintained at about 24°C with about 60% humidity provided by a mister system. This is programmed to operate for five minutes every afternoon, being beneficial for the plants as well as encouraging reluctant bathers to clean their plumage. In the wild Greater Niltavas are said to eat berries during the winter to supplement an otherwise insectivorous diet. Given the choice, however, berries and fruits in general are not at all popular and in captivity a good quality, fine-grade insectile mixture will completely meet a Niltava's nutritional requirements. Some 10% of the insectile mix should contain livefood such as mealworms, wax moth larvae and medium sized crickets. And if not already moist, the mixture should be softened with milk, pureed apple or tofu. As for all insectivores, I add finely chopped or mashed hard boiled egg since it is an often popular food, coming a close second to the insects themselves. It presumably resembles ant pupae or a similar food eaten in the wild (see also Vince 1994). Niltavas build a cup shaped nest either in vegetation or concealed in cavities, such as may be found in rockwork or rotten tree stumps. The Niltavas were therefore offered a half open-fronted nest box measuring 15cm x 15cm x 23cm high. It was empty and fixed high up at the back of the aviary so as to almost touch the roof. In the middle of February both birds became more vocal than usual. Even at its loudest the Greater Niltava is a quiet bird but now the soft, ascending three or four note whistle could be heard often, sometimes repeatedly for 30 seconds or more. The pair was rather shy, but luckily I did see the female try to attract the male to her: with her body lowered about 2cm she stood on a high perch and fluttered her wings, but he was not enticed and her amour appeared to die there. Three weeks later, however, on March 6th, nest building began and lasted for eight days. The nest was constructed in the box provided and was a full 7cm deep when complete. It comprised pieces of fine string, leaf fragments, fine grasses and Sphagnum moss. By far the major ingredient though was bison wool collected from the zoo's North American exhibit; lambs' wool was also offered but little was accepted. As far as I could tell the female alone built the nest and, very interestingly, did appear to discriminate between the wools. She selected almost exclusively those of a dark shade, ignoring the paler colours, especially white, irrespective of whether they were lamb or bison in origin. Much of the lambs' wool was in fact white and I am sure that explains its lack of appeal, since as a nesting material most other birds find it to their liking. Although I have had little experience of birds selecting materials according to their shade, the pale fibres may have been rejected because they were considered too conspicuous. The nest was completed on March 14th and the first of three eggs was laid on the 15th. Incubation was carried out solely by the female and began with the laying of the first egg. The eggs were an ivory colour but very heavily marked with rust coloured speckles of varying sizes. Three weeks passed and nothing had come of the clutch; the eggs were found to be clear and were duly removed. Twelve days later three more eggs were laid but they too were clear. Fourteen days after their removal another clutch of three was laid. This time all were fertile and three chicks hatched, one day apart, following 14 days of incubation. Plenty of wax moth larvae, mealworms and medium sized crickets were offered as a rearing food to supplement the standard insectile diet as well as maggots and hatching blowflies. The latter had proved very successful in the rearing of Verditer Flycatchers although were completely ignored by the Niltavas. Care was taken to dust the livefood with a vitamin and mineral powder since the most risk of rickets in insectivores' chicks is higher than with most other softbills: omnivores feed their chicks purely livefood only for the first week or so, thereafter feeding the more varied adult diet. But insectivores such as Niltavas receive purely livefood for about the first month, until they are old enough to feed themselves and therefore follow their parents' example in eating the insectile mixture. Experience has shown that 1 week is not long enough to give rise to rickets although 1 month almost certainly is. I only ever observed the female taking food to the nest with the male standing guard; I do not think he was specifically guarding her but his nervousness at one's approach alerted her, nevertheless. As with many birds the wax moth larvae was the favoured rearing food but for reasons I have never been able to fathom, the female also fed tiny pebbles to her young, a fact not apparent until two chicks were thrown dead from the nest nine days after hatching. Though looking very much alive and with prospects, the third chick seemed doomed in the care of its mother. It was therefore removed for hand rearing at 10 days of age. The chick weighed 27.3g and was initially brooded at 90°F although this was reduced to 80°F two hours later, in response to the bird's mild panting. The chick was taken from the nest on June 14th at 9am. At 10.30 six tiny pebbles, 2mm in diameter, were found beside the bird and since they were not in the faeces were presumably coughed up. From there onwards it was plain sailing, especially since the chick was fully feathered, reasonably large and, had it remained with its parents, only three or four days from fledging. Chopped pinks, wax moth larvae and mealworms were the rearing foods being dipped in pureed green beans (as sold for newborn babies) before feeding. Included also was a sprinkling of a vitamin and mineral supplement to guarantee the diet's quality. On June 14th a total of six chopped pinks plus eight moth larvae and mealworms were eaten, spread more or less evenly over eight feeds from 9:00am to 9:00pm. The following day the Niltava was perching on the side of its margarine tub. Its appetite had dropped slightly but on the 16th, rose to consume 10 pinks plus five larvae and worms. On the 17th, flying skills were discovered as the chick almost flew out of the brooder. And on the 21st it started to feed itself, eating a couple of slices of pink. From the 21st to the 30th, the chick was fed four times a day. By hand (using tweezers) it was now only being fed five to six pinks a day with the remainder of its diet taken by itself from a food dish. The dish contained the standard insectile diet but with chopped pinks on the surface. Although the pinks would not feature in the adult diet, they were still of value; in eating them the bird would be introduced to the insectile mix as it stuck to their wet surfaces. Hand feeding was gradually reduced until on July 13th it was stopped completely. The bird was now 5½ weeks old and placed in its own indoor aviary that was maintained at about 70°F. By now the chopped pinks had been removed from the diet and the young Niltava was thriving on the standard adult insectile mixture. H0WARD,R. and MOORE,A. 1991. A Complete Checklist of the Birds of the World. Second edition. KING, B., HOODCOCK, M. and DICKSON, E.C. 1991. A Field Guide to the Birds of South-East Asia. VINCE, M. 1994. Long-tailed Tailor Bird. AFA Watchbird, Vol. XXI, No.6.